The Division of Quantitative Sciences facilitates the development of state-of-the art quantitative methods by members from biostatistics, bioinformatics, computational biology and health informatics. Some noteworthy research areas include adaptive trial designs, Bayesian approaches to personalized medicine, mediation analysis for microbiome, and novel techniques for single cell RNA sequence analysis. The Division also provides education and disseminates information to ensure the scientific rigor of cancer research through seminars, individual sessions and short courses tailored to cancer researchers. Supports development of novel quantitative approaches. Division of Quantitative Sciences members research new quantitative methods required by state-of-the-art research to enable the advancement of cancer research. Engages in methodological research. Members with biostatistical expertise, strategically aligned to a Cancer Center research program, contribute towards furthering the statistical or bioinformatics methods relevant for each Research Programs goals. Encourages collaboration. With members from a wide variety of backgrounds, the Division is able to leverage broad quantitative expertise. Groups of members are able to work together to approach standard problems in unique and productive ways. Tailored education for cancer researchers. The Division of Quantitative Sciences provides education and disseminate information on resource technologies and services by offering short courses, lectures, and workshops on fundamental biostatistical and bioinformatics topics for cancer researchers to enhance members’ research skills. Ji-Hyun Lee, DrPH, joined the UFHCC as director of the Division of Quantitative Sciences and Biostatistics Shared Resource in July 2018. Dr. Lee is also professor of Biostatistics at the Department of Biostatistics in the College of Public Health and Health Professions and in the College of Medicine. 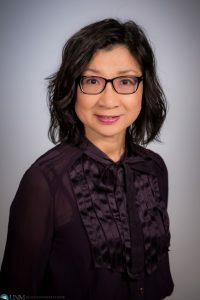 Prior to joining the department, Dr. Lee was Director of the Biostatistics Shared Resource at the University of New Mexico Comprehensive Cancer Center for four years and a faculty member of Biostatistics at the Moffitt Cancer Center for 11 years. Dr. Lee earned her doctorate in biostatistics from the University of North Carolina at Chapel Hill. She is an elected American Statistical Association (ASA) Fellow and a Certified Professional Statistician through the ASA (PStat®). Her research interests include clinical trials, group randomized trials based on communities, methods for repeated measurements, Bayesian approach and Best Statistical practices. You can reach her at jihyun.lee@ufl.edu and 352-273-9079.